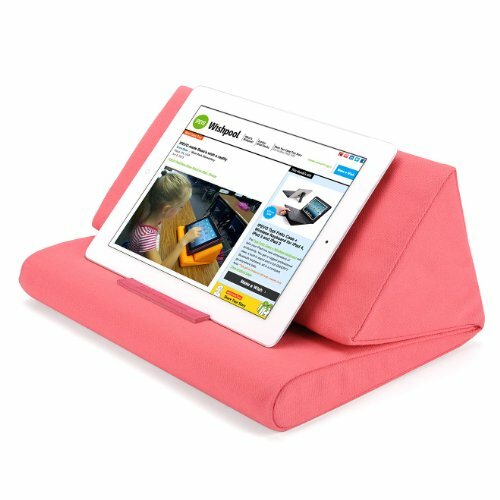 The cushy, comfy, cozy PadPillow stand is designed to keep you and your iPad comfortable. A soft, huggable pillow lets you rest your iPad on your lap or stomach for all those times you'd prefer to skip the desk. 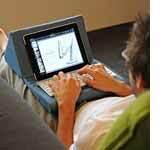 PadPillow provides ultimate versatility for your iPad use, all with the comfort of your body in mind. PadPillow is designed for you, not just your iPad. Alternately, fold PadPillow's sections together for a compact pillow great for your lap, the couch arm, or the chair next to you. 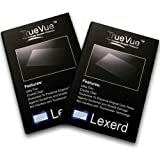 In this position, a raised leather label acts as a simple stopper for the iPad, which rests at an ideal angle for all your multimedia applications. This product's soft foam is complemented by an equally soft, 100% cotton cover. The stonewashed denim cover is as comfortable as that old favorite pair of jeans, and is removable and machine-washable. 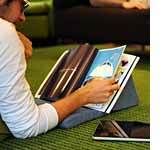 PadPillow is so cushy, you could use it as a pillow for your head after you finish using your iPad. Don't confine your tablet computing and ebook reading to the desk or table. 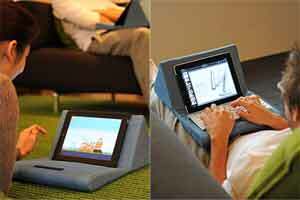 Free your iPad and take comfort computing to a new level with PadPillow. If you have a reader or avid iPad user in your life, chances are they will love PadPillow's any time, anywhere comfort. PadPillow makes a perfect gift for birthdays, holidays, graduations, employee appreciation, or for a new year at school. *Search "Make your own PadPillow" and find the IPEVO's blog entry to make your own cover with your favorite fabric.